I have to say that while I am so happy to have been picked for what I'm sure will be an incredible experience, I feel a little guilty. I often get like this. Of all the people that got picked, I know I'm not the fastest. The funniest. The biggest blogger. The most motivated. Etc, etc. And somehow it feels a little wrong to be OMG SO EXCITED when people I like and respect aren't able to get all giddy and happy with me. Feel free to hit the X at the top of the screen if you want to leave it at that. Because I'm about to get deep. As deep as I get, anyway. I often feel guilty for succeeding. Or for doing well. This is something I really, really struggle with. I'm allowed to celebrate when something goes well! In school I was a little bit of an over achiever, and I was made fun of A LOT for that. I wasn't a "cute nerd" that is super trendy today. I was just a straight up dork. I started high school when I was 12 and moved away to college in a new country when I was 16. I wasn't as mature as those around me, but I could keep up with the work. You don't need to be a rocket scientist to figure out that brains + lack of maturity = uncool outcast. I used to hide my test results from people and pretend I did poorly. Or lie about my age in college so no one would realize that no, not only could I not legally have that beer, but I also couldn't vote. Or drive. Or play on a sports team without faxing the forms to my parents to sign. I went back in time today and felt all those feeling again. So here I am, saying....I'm happy! While I'm disappointed that in order for people to be picked there also had to be people that weren't picked, I'm still proud. And that's how you can tell I'm no longer a teenager. What was your high school experience like? Super cool? Super jock? Super hide-in-the-lockers at lunchtime? I was lucky to go to a really small Christian high school where there weren't really cliques. I got along with most people because they had no choice but to hang out with me. One year there were 5 kids in my entire grade! But teenagers are still stupid and I got made fun of for my grades and my age. Luckily I had a lot of friends from different groups so I was pretty happy. Do you get embarrassed about success or revel in it? Normally I'm excited and want to share it with Tim and my family, but beyond that I get a little embarrassed about the attention. P.S. - Didn't get a chance to see my nuun entry! Check it out here! Congratulations Vanessa! I think it's going to be a great group and I'm really happy that you were chosen! I loved your entry! Dork or not, it was amazing :) You totally deserve to be on this team! Ahhh congrats again! You are amazing and SO perfect for this relay! You are going to have a blast and YES, you should be happy! CELEBRATE! Woohooo! I was a preppy Hippie....totally doesn't make sense but I dressed nicely but I wasn't the most behaved person ;) I still got decent enough grades though (once again Prep) and did a good amount of skipping school at the same time. I had a way of doing what I needed to get by and not really be noticed at the same time. BUT from my post of "winning" the trip to NYC, I get the same way. I get embarrassed and shy when I'm in the spotlight and others are not. Let's focus that guilty energy into making an effort to not turn your blog into a Nuun love fest, mmmkay? Congrats!!!! You deserve it and your video was awesome! I smiled when I saw your name on the list! I was really hoPing you'd make the team! I was a band geek who wasn't a complete loser, but I was naive and genuinely believed everything people told me. So gullible and I think I just never thought that people would want to make things up - so I kind of think I got laughed at behind my back for being naive. But, I made it through relatively unscathed. I'm so happy for you!!!!!! Congratulations!!! I was lucky enough to go to a school that wasn't too cliquey. We definitely didn't have the problems with bullying and all that that I hear so much about kids dealing with now. I mean, yeah, you had your jocks and cheerleaders and band geeks (I can say that because I was one), but there were HUGE overlaps in those groups. Everybody had friends in all the little groups, so the clique lines were very smudged. Woohooo!!!! Congrats! Enjoy this you deserved it no matter what the little monsters within your head tell you! Have a blast and enjoy every minute! Congratulations, you definitely deserve it, don't feel guilty. I won't go into the horror that was high school! CONGRATULATIONS!!!! 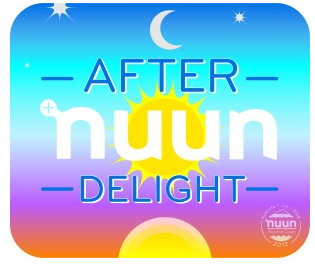 You will have a blast on After Nuun Delight!!! The HTC will be an awesome experience! The PNW is truly God's country (I AM biased since I'm from Seattle!). In High School, I was a nobody who desperately wanted to be cool. There were some MAJOR cliques back then and I could never break in. I'm probably a better person because of it. Congratulations!! I saw your name and got excited for you!! Congrats V! I don't believe in the "don't brag...you don't want to hurt others' feelings". Girl - you shout it from the rooftops! Go ahead - this is an accomplishment; you had to work for it, and you will continue to work for it. Good going! I was such a dork in HS, and not the cute/quirky kind either. My friend makes fun of my outfits to this day. I am cringing just thinking of it. Congrats! I say some celebrating is in order tonight - hopefully the kind that includes extra dessert. I'll have some too, in your honor. congrats!!!! I hope you have a wondeful time at HTC! Very exciting! You deserve it as much as anyone else. Be happy! Congrats! How exciting for you and all the rest of the awesome people on the team! Maybe I will get to see you over there! Congrats babe! You have every right to be proud! Way to go, congrats, Vanessa!!! Excited for you. You are so funny - own it. You deserve it!!!!! CONGRATS! Congratulations! What fun, I can't wait to hear all about it. Congratulations Vanessa! I am so happy for you. I see you are on the same team as Caroline (a Canadian Runner in Exile) and hope you have the best time. In school I was way younger than everyone too and had a very strict Father which made it worse. I played down my brainiac tendencies too. ahhhhhhhh so happy we are both going!!!!!!!!!!!!!!!!! in HS: I was the jock-nerd nothing cool...way too tall and too skinny and yeah and too good grades = not cool!!! CONGRATS!!! sooo awesome rapping lil' 'nessa made the team!! :) revel in it girl, u deserve it...hehe. Oh wow! That's awesome. Way to go! I loved the video you sent in ~ you deserved to win. SO SO EXCITED FOR YOU!!! Congratulations on making the team!!!!! congrats! Should be a good time! Congratulations... you really do deserve it. Can't wait to see how everything goes! Congratulations!!!! And this is just me wondering, because I've always wanted to know...Does Nuun finance the whole trip, just the entry fee, etc? If it is the whole trip, then that is more than awesome!!! That is terrific, Vanessa! It will be an experience that you'll always remember. I cannot wait to read all of your posts and see pics! Vanessa- I am beyond unbelievably excited for you. you are one of the most humble and hard working and encouraging people i have ever met. I think you were so deserving! and I can't wait to read about your adventure :) CONGRATS! in high school i was definitely the nerd. the one scared to even step across any line that would mean i was a "rule breaker"...i got made fun of for that...but I think i often worked so hard to make my parents proud. i was so scared to disappoint them. i can relate to what you said about feeling bad for succeeding. i have felt that before lots of times! i hate to disappoint people. and i hate to disappoint myself. Your entry was amazing! You deserved to get selected! I have had similar feelings being selected last year as an Aquaphor ambassador & this year as a Clif bar ambassador since I am not speedy/top of my age group. The reality is you made a great application video & they selected you. Enjoy!! Now have fun with it & make the brand proud! The video was cute! Good for you! Congrats to you, Vanessa! I'm so excited for all of you--it's gonna be such a blast. Thanks for sharing your story, too. I appreciate when people are slow to boast- and you share your achievements in a very tactful way. I went to a small Christian high school too and had a great experience. I sometimes felt the need to gloss over good grades too but I wasn't especially nerdy or cool, somewhere in the middle. COngrats! I was so so excited when i saw you on the list!!! I love your application. So funny, so great! Congratulations on being chosen. Kelsey and you will have a great time! LOL your video is so funny! Congrats on making the team. You deserve it!! Love the video and congrats on the entry. I was so pumped when I saw my mane up there. Hopefully we'll get a chance to meet and run!! congrats vanessa, you all are going to have so much fun! I did the test hiding thing too. But other than that I was pretty outspoken. I've always been the one everyone looks to when justice must be served...like the amount of homework was excessive or the text book was wrong. I was very not cool and definitely not hip. I think that means I was pretty much a dork, right? Yeah, high school was not such a happy time for me. Congrats on getting in to the HTC Nuun team! You will have a blast! Congratulations on making the Nuun HTC Team!! Can't wait to meet you in August!! The video is too funny. :) Awesome job.